The amount of crime within our seven counties is substantial. The families of crime victims, as well as survivors, face unimaginable pain and suffering, both emotional and financial. We offer our programs to the crime victims and their families. We provide families of crime victims with the ability to reach out to the public for help in solving their loved one’s case with the use of televised press conferences, posters, door hangers, website, and social media at no cost to them. 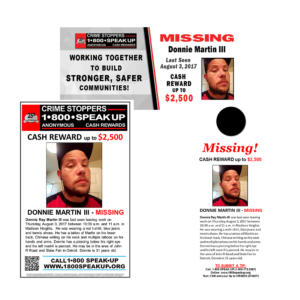 Billboards can be purchased by the family at a discounted rate through Crime Stoppers. Need our services? Fill out the request form! Bi-monthly support group meetings offer families of crime victims grief support, encouragement, and guidance for healthy coping tools. 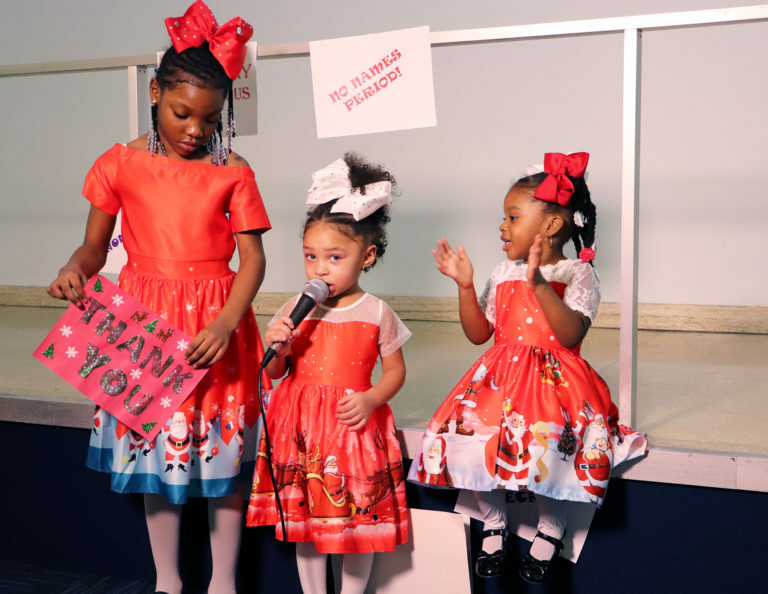 Crime Stoppers also hosts several special events for these families each year such as our annual Christmas Party and Summer Picnic for the families we serve! Watch our mini documentary about the Family Meetings for more information! Download our Family Meeting information sheet for more information and dates to future family meetings. 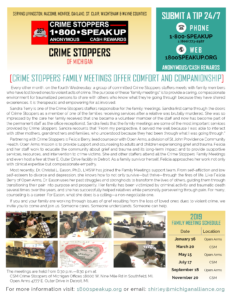 Every other month, on the fourth Wednesday, a group of committed Crime Stoppers staffers meets with family members who have lost loved ones to violent acts of crime. The purpose of these “family meetings” is to provide a caring, compassionate environment for traumatized persons to share with others who actually know what they’re going through because they have shared experiences. It is therapeutic and empowering for all involved. Partnering with Crime Stoppers is Felicia Berry, lead counselor with Open Arms, a division of St. John Providence Community Health. Open Arms mission is to provide support and counseling to adults and children experiencing grief and trauma. Felicia and her staff work to educate the community about grief and trauma and its long-term impact and to provide supportive services, resources, and intervention to crime victims. She and other staffers attend all the Crime Stoppers Family Meetings and even host a few at their E. Outer Drive facility in Detroit. As a family survivor herself, Felicia approaches her work not only with clinical expertise but compassionate empathy. Most recently, Dr. Christal L. Eason, Ph.D, LMSW has joined the Family Meetings support team. From self-affliction and low self-esteem to divorce and depression, she knows how to not only survive—but thrive—through the fires of life. Like Felicia Berry of Open Arms, Dr. Eason uses her past struggles and strongholds to transform the lives of others, guiding them through transitioning their pain into purpose and prosperity. Her family has been victimized by criminal activity and traumatic death several times over the years and she has successfully helped relatives while personally persevering through pain. For many, counseling is a career. For Eason, what she does is a calling—a non-negotiable one. If you are interested in participating in a family meeting, please fill out the form below. Were you, or someone you love the victim of a crime? Please complete the following form. This form is to request information about our program services if you want to submit an anonymous tip, please click here.